TheaterSeatStore.com: Does it get better than this?? You know when you have arrived.....when this is your home theater room!! Used by a Hollywood executive on transcontinental flights, this is probably as good as it will ever get. Installed to allow for better productivity while traveling, this lcd was, at the time, the biggest ever on a private plane. Many planes bought today have interiors custom designed by their owners to meet their needs. 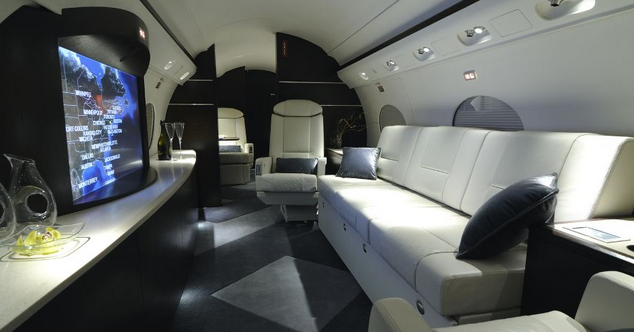 If one would consider a custom design for one's home, then why not do the same for one's private plane. Common design requests include home theater environments, marble floors, bedrooms en suite and decorative artwork. Not surprisingly, one of the most requested elements are custom crests with initials. These type of interior design jobs commonly run into the millions, depending on the level of customization and features. The design process involves several creative renderings of the desired interiors before the final product is agreed upon. Often the latest in 3D dimensional modeling technology is leveraged to create an experience, as close to the final product as possible. Luxury does not fly much higher than this.